Donate now to the GoFundMe Campaign! Today the Secwepemc Women’s Warrior Society and Ancestral Pride launch the Imperial No More Campaign. We are launching this campaign to stop Imperial Metals before they cause any more violence and devastation to the lands, waters and our lives. We are seeking support to protect our unceded territories and to ensure the children of all people can eat the salmon and breathe the air, we cannot do it without your support. Kanahus Manuel of the Secwepemc Women’s Warriors Society, mother and artist and Sacheen Seitcham of Ancestral Pride, Grandmother, medicine maker and traditional midwife have been organizing resistance to the illegal mining operations of Imperial Metals on their territories since before the devastating tailings pond breach in 2014. We stand to protect Yuct Ne Senxiymetkwe and Chitaapi Mountain from Imperial Metals. 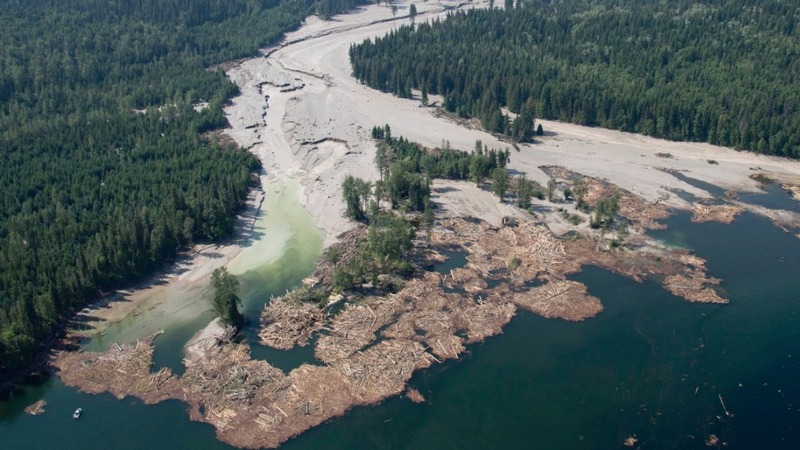 Despite their efforts Imperial Metal’s Mount Polley mine continues to operate and in November 2015 the province issued a permit for the company to discharge their toxic tailings into Hazeltine Creek, the same waterways affected by the 2014 breach. The creeks, rivers, lakes and ocean are all connected. The poisons being discharged into Hazeltine Creek flow through the connected waterways. The salmon which return to the rivers form the oceans must pass through the toxins never cleaned up by Imperial Metals. This is not just an Indigenous issue, we all live downstream. The destruction of the land by mining is violence and enough is enough. Two full years after the catastrophic breach of Mount Polley’s Tailings Pond, Imperial Metals continues to operate illegally destroying the land and endangering the lives of all the surrounding people. 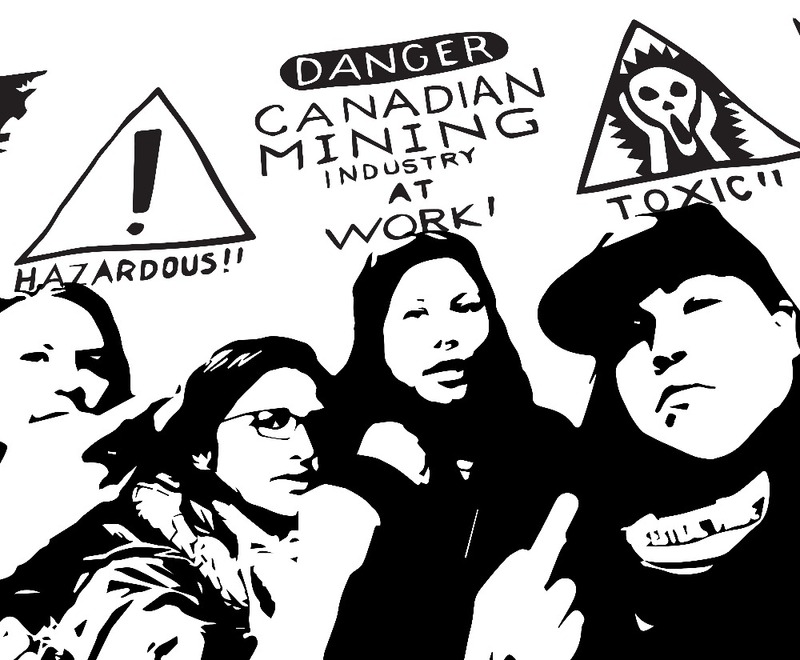 Over the last week the Secwepemc Women’s Warrior Society and Ancestral Pride have been taking direct action with the support of allies to show Imperial Metals that we will escalate resistance until they cease and desist all mining operations on our Indigenous territories. On August 4th we marked the 2-year anniversary of the devastating Tailings Pond breach with a gathering of Indigenous land defenders, allies and supporters to shut down the mine and to assert sovereignty over our unceded territories. There were workshops, feasting, training, ceremony and information sharing. After skilling up together we completely blocked all workers from returning to work and stopped mining activity. On August 9th the Secwepemc Women’s Warrior Society and Ancestral Pride successfully occupied the Imperial Metal’s Vancouver Office. Imperial Metals ordered thirty police offers to violently assault Indigenous women and supporters, with four arrests and many bruised bodies. Spirits remain high and we know the world is watching, we have support from around the world. It is time to gather the resources to SHUT IMPERIAL METALS DOWN! All funds raised will be used to develop and maintain the campaign to Stop Imperial Metals. Up to this point Sacheen, Kanahus and their supporters have been operating on their own funds and small contributions from their networks. • For the materials and equipment necessary to hold events, direct actions and provide documentation for media releases. 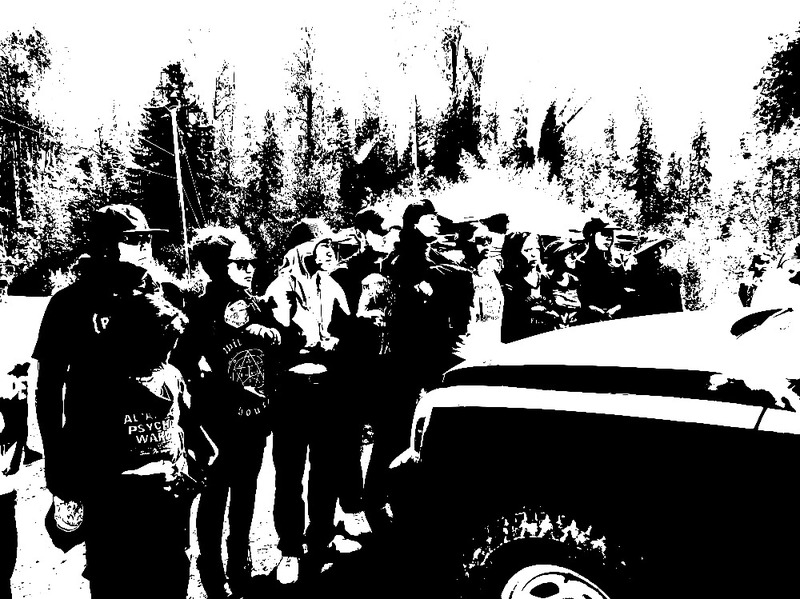 • To repair our vehicle and cover the travel costs for members of the Secwepemc Women’s Warrior Society, Ancestral Pride and their supporters to be where they need to in order to continue pressure on Imperial Metals and their shareholders. This also means we will be able to connect with the grassroots community, indigenous and non-indigenous most affected by Imperial Metals mines. • To ensure we have the necessary funds for any legal fees that arise when the RCMP come down on our supporters and us. • For awareness spreading materials and activities. • To provide capacity building featuring Guerilla Media training, grant writing opportunities for other indigenous land defenders and our supporters. • To build homes at Tska7 (Ruddock Creek) and Chitaapi (Catface Mountain) to assert our rights and title over our territories by living on them. This is most important as occupation is key to stopping resource extraction! • We plan to host a large gathering that can bring together members of effected communities and our supporters to strategize and build a stronger movement to resist Imperial Metals on all affected territories. Imperial Metals is engaging in mining practices and operations that are in direct oppostion to the protocols and inherent rights and title of the Secwepemc, Ahousaht, Tla-o-qui-aht, Wet’suwet’en, and Tahltan First Nations. ImperialMetalsOccupation from subMedia.tv on Vimeo. We successfully occupied the corporate headquarters of Imperial Metals. 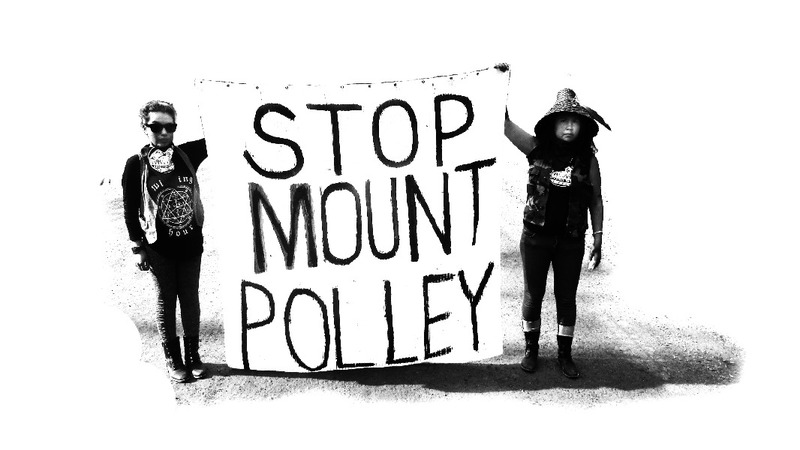 Two years after the Mount Polley disaster, Secwepemc Women’s Warrior Society and Ancestral Pride had an action to show Imperial Metals that we will escalate resistance until they cease and desist all mining operation in our Indigenous territories. Imperial Metals ordered thirty police offers to violently assault Indigenous women and supporters, with four arrests and many bruised bodies. But our spirits are high and we know the world is watching, we have support from around the world. We are holding their responsible for the violence against Indigenous lands and Indigenous women. We sent a message to investors and shareholders, including President Brian Kynoch who was in the office, that they are violating our Indigenous Rights and Title and violating our free, prior and informed consent. Shut Down Imperial Metals AGM! Please come and join in the fight against mining. Imperial Metals is a mining company that is responsible for the biggest mining disaster in so called British Columbia at their Mt. Polley mine, to date they still have not cleaned up their toxic tailings spill and they have resumed operations! Indigenous Land Defenders: Ancestral Pride, Secwepemc Womens Warrior Society, and our allies No One Is Illegal and others to be added ask that you stand with us as we confront Imperial Metals Mining Corp and thier share holders at their Annual General Meeting! This company is engaging in mining practices and operations that are in direct oppostion to the protocols and inherent rights and title of the Ahousaht, Secwepemc, Wetsuweten, Tlaoquiaht and Tahltan First Nations. We say: Yes To Mother Earth No To Mining! We are in solidairty with all mining affected indigenous peoples world wide! To show your solidarity you can make a sign take a pic and post it on all your social media using our hashtags #IMPERIALNOMORE #WEARECHITAAPI #STOPMTPOLLEY #STOPIMPERIALMETALS to create awareness, you can alse share the event and invite everyone you know! * Aquí la oportunidad de retribuir la solidaridad a las/los guerreros indígenas de Canadá, que se han solidarizado con las luchas de América Latina y el mundo entero, en contra de innumerables injusticias, entre ellas la minería asesina, que está acabando con todo: mares, ríos, árboles, aire, fauna, flora, y claro, con la vida misma, o ¿acaso no han leído del infierno que viven las comunidades en donde una minera canadiense va y echa su mierda para saquear los metales? Las que invitan, son nada menos que las mujeres indígenas de los territorios no cedidos en Canadá, que sin titubeos alzaron la voz y se sumaron a la lucha en contra de la desaparición forzada de los 43 estudiantes de Ayotzinapa, en México. Cuándo: Viernes 27 de mayo a 09 a.m.
Por favor, vengan y únanse a la lucha contra la minería. Imperial Metals es la empresa minera responsable de la mayor catástrofe minera en la llamada Columbia Británica, a través de su mina en Mount Polley. ¡Es la fecha en que no han limpiado su derrame de relaves tóxicos, y ya han reanudado operaciones! Los Defensores Indígenas de la Tierra: Ancestral Pride, Secwepemc Womens Warrior Society, y nuestros aliados de No One Is Illegal de la Costa Salish (territorios no cedidos), más otros por agregarse, los invitamos a protestar con nosotros para confrontar a Imperial Metales Mining Corp y sus accionistas en su Reunión Anual General. Dicha compañía está incurriendo en prácticas mineras cuyas operaciones se contraponen a los protocolos y derechos inherentes a la propiedad de la Tierra, de las Primeras Naciones Ahousaht, Sepwepemc, Wetsuweten, Tlaoquiaht y Tahltan. Decimos: ¡sí a la Madre Tierra, no a la minería! Estamos en solidaridad con todas las poblaciones indígenas del mundo, afectadas por la minería. Para mostrar su solidaridad pueden hacer pancartas, o tomarse una foto acompañada de los hashtag #IMPERIALNOMORE #WEARECHITAAPI #STOPMTPOLLEY #STOPIMPERIALMETALS y subirla a sus redes sociales, o publicarla en sus medios de comunicación. Ayúdennos a crear conciencia, compartiendo el evento e invitando a todos sus conocidos.